Amazon recently announced that the certification exam for AWS Machine Learning Specialty is out of beta. I took it this morning at one of the AWS testing sites. Below are my thoughts on how to successfully tackle this new certification. Amazon provides a study guide on what domains to expect in the exam and how many questions there will be for each particular domain. This should be your first stop to start framing the topics that you should study for the exam. By no means should it be the last. Your mileage may vary and you might see a different breakdown but from the above breakdown, you can see that you will be able to answer a good bit of questions even if you don’t know anything about the AWS services. 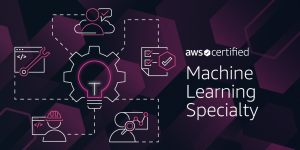 However, in order to pass, you will need to know to understand when certain AWS services are applicable and how to use them together to solve machine learning problems. My estimation is that if you have passed at least one of the Associate level certifications AND you are familiar with the AWS machine learning services, you will have enough AWS expertise to be able to pass this certification. Next, let’s explore which AWS services you should focus on and learn about to pass the certification. I will list them in order of importance. All the other AWS Machine Learning Services. Know what they all do, their basic features and usage, and when one is better than the other. Amazon EMR and AWS Glue. Know what they are and when to use one over the other. Also be at least somewhat familiar with Spark, Hadoop, Hive, etc. Amazon S3. This basic, unsexy and super useful services had quite a presence in the exam. Know how to use S3 with Sagemaker securely. Be familiar with CSV, JSON, Parquet, RecordIO protobut and other common formats. When are certain repositories better solutions? S3 vs. RDS, etc. Amazon Identity and Access Management (IAM). Security is always an important topic and having secure deployments and data is applicable as well in the machine learning domain. The use of the other AWS machine learning services. To keep the article short, I will merely list out words and key phrases that should allow you to research the machine learning relevant topics that you can expect in the test. Both courses are in development and I expect them to get better in the next few months. The Acloud guru offering has a lot of stubbed out lessons which are not yet developed but will most likely be done in short notice. Noah Gift’s course is more complete as of now and I did get the chance to talk to Noah and he mentioned he has plans to keep on improving the course as he gets more feedback from his students. Also, both courses require a subscription to the sites that host the courses. In the case of Safari Online, they offer an online trial period. Finally, a little advise about the data of the test. Like the other specialty exams, you have 3 hours to complete the exam. I know this topic fairly well so it took me 90 minutes to finish the exam. I found that some the questions while hard are not long. I believe I had to scroll down the page in only one of them. If you study appropriately you should be able to finish on time but do make sure to pace yourself during the exam. For some of the other exams, I found it useful to have “gate” questions. These are questions where I will look up and see how I am doing with the time. In this case, the math is easy, in this exam there were 65 questions and you have 180 minutes so that means that you should be done with 22 questions at the end of the first hour and with 44 questions by the end of the second hour. It’s important to keep a steady pace to make sure you are not going too quickly, making mistakes and burning out or too slow and run out of time. Try to not look at the clock until you get to your “gate” questions. You don’t want to waste time watching the clock. Also, I have always made sure to schedule the exams on a Saturday. You want to be well rested and in an optimal state of mind when you take the exam. This is especially true with the Professional and Specialty exams. Please post any questions you might have below but make sure to not ask questions about specific questions from the exam. Good luck!